Millions and millions of people world wide suffer from partial or complete hair loss. There exist varied reasons of this agonizing problem. So it is very difficult for dermatologists to ascertain exact reason of hair loss. However if the loss of hair strikes after usage of certain medications, it could be easily adjudged as a side effect of medication. But many a times the underlying reasons for hair loss remain unidentified. 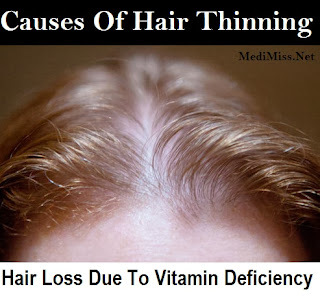 And one such hair loss is deficiency related hair loss. 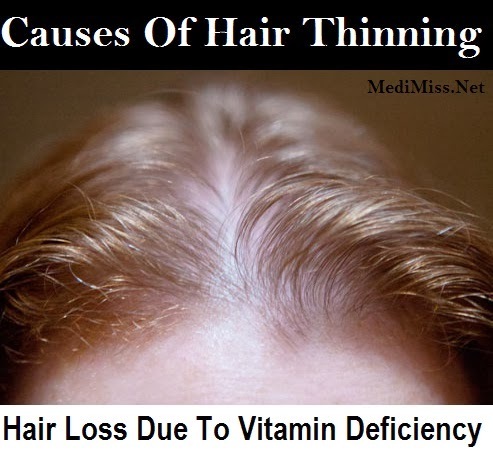 Malnutrition or deficiency of nutrients and vitamins often paves the way for hair fall. So you must check your sharp hair fall against these deficiencies. Hair follicles require certain vitamins to carry on their constant function of regeneration and growth. If follicles remain deprived of these vitamins they won't be able to carry out their normal functioning and may result in hair loss. Most often due to poor dietary habits or disturbed metabolism folks happen to be deficient with these vitamins. So a change in dietary habits or food intake is necessary to ensure enough intake of necessary vitamins for hair in order to prevent hair loss. Vitamin A, E and B are of special significance in keeping the healthy hair. Vitamin A keeps hair moist by helping them to secrete sebum in scalp as per requirement. This sebum keeps hairs away from dryness. This dryness of hair happens to be first step towards hair fall. So there must not be deficiency of this vital vitamin that also happens to be an anti oxidant. Vitamin E performs the vital function of increasing level of blood circulation towards scalp and also helps follicle cells take enough oxygen. This result in enhanced ability of follicles to regenerate and grow hair. And the deficiency would adversely affect follicular function. And four different types of vitamin B also cast adverse effect on hair condition if present in less than needed level. Biotin is a complex vitamin B that effectively curbs hair loss and contribute greatly in keeping hairs firm on scalp. Milk and egg yolk are major sources to cover up this deficiency. Para Amino Benzoic Acid is another B complex that is of equal significance for hair nourishment. Vitamin B6 and Inositol are other two B vitamins that are necessary for healthy hair. If you are facing deficiency of these vitamins you should incorporate food items in your diet to ensure sufficient intake of these vitamins. It would lessen possibility of hair loss.